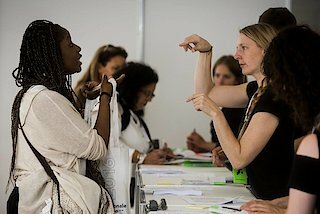 We are excited to announce that you can register for Tanzmesse 2018 beginning 4 May, either as a Booth Attendant or a Professional Visitor. We polished the registration area of our website in order to streamline the registration process for you. Read ourRegistration Guide to find out more. In order to further facilitate networking for Tanzmesse participants, all registered users now have the possibility to create an online profile. All it takes is log into your Tanzmesse account, navigate to “My Data” and add all the information you want to share with other participants. You may even upload a profile picture. As of June 2018, you can browse through the growing list of participants. We hope you enjoy the possibilities of this new feature that will help you to prepare for Tanzmesse 2018 and get in touch with each other.